So I went back and added spots for name and owner as you can see. The checkboxes are for hitpoints. You darken the outlines of all the hitpoints a particular animal has. 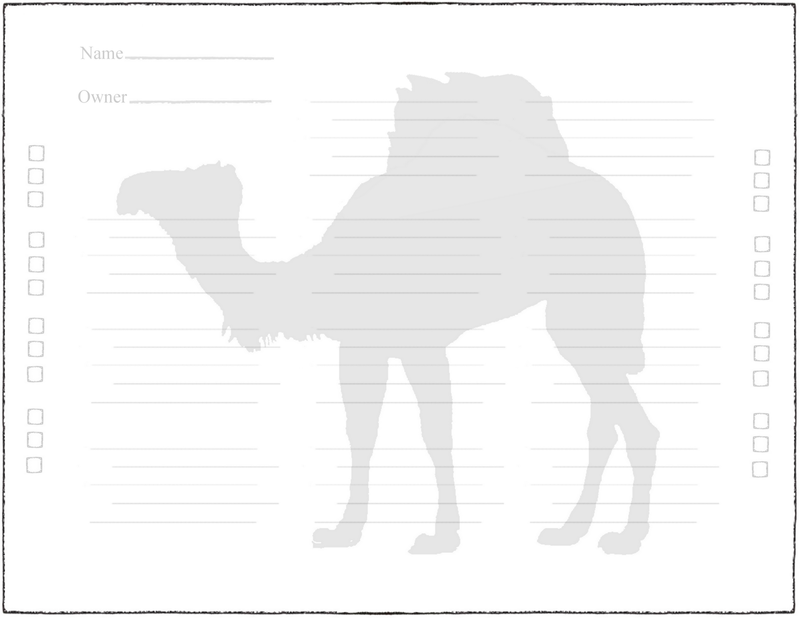 There was some variation between rule sets so I just put down 24 for mules and camels. That's enough for 3 eight sided hit dice and you can use less if your ruleset uses d6 hd or whatever. In combat you pencil off checkboxes as they take damage. You could even put little asterisks or colored marks between boxes to flag when an animal would try to flee or go berserk (thanks to Carjacked Seraphim Jim for that idea). 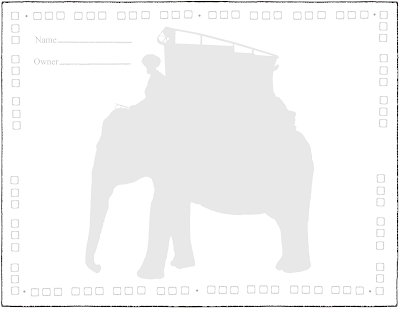 Here is an elephant with a mahout and howdah meant for tiger hunting. I couldn't find any pictures of elephants straight up carrying loads. It seems there were either used for transport like this or bulldozers moving logs around with their tusks. So I'm not sure what to do with them. 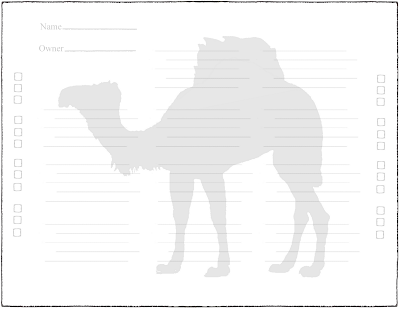 I have some ideas-- maybe put silhouettes for how many armored adults they can carry, or insets that will blow up to full cargo sheets of 450 lbs each. But I'm not sure how much Indian elephants can carry. Such a simple range to want to find and so hard to find online. Same with gorillas, I saw that they were anywhere from 6 to 13 times as strong as a man. That's arm strength though, doesn't mean you could even fit all that weight on their back. I'm thinking they might only be capable of carrying a smaller pack, something closer to the mule, but come with the extra capabilities of opening doors and bending iron bars like a beast. If you have suggestions of carrying capacity for different creatures, or know a place that has them let me know. I keep looking at the AD&D Wilderness Survival guide, but they gave 500 pounds for a mule which made me doubt their judgement (some mules could do that, but I think the average mule was smaller). How about dinosaurs or mythical creatures? Oh, and the elephant has enough boxes for 10.5 eight-sided hitdice. If that isn't enough for a particular ruleset let me know, but I wanted it to look aesthetically pleasing too. Late night addition: It's pretty cool learning how these different animals are good at different things maybe this is the first step to having these kinds of creatures more real in my world. 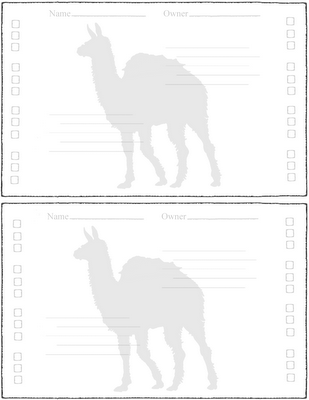 For example, llamas carry less than all the others but eat less and are even better than mules on treacherous terrain. They are fine in the cold too. 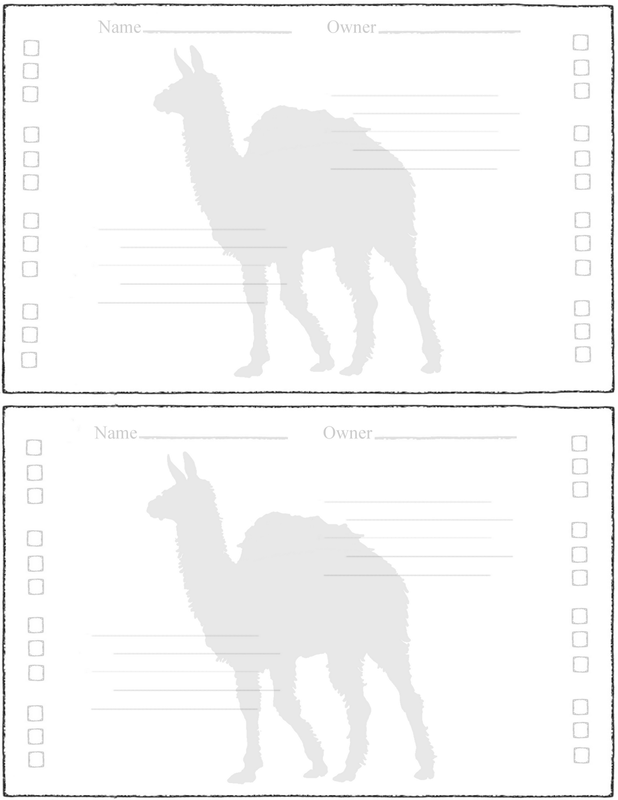 I'm not really happy with the llama's silhouette, but that's the best I could do after hours of looking. Only 10 slots here which gives you ~75 pounds. Again, bigger individuals could probably carry more, but we're shooting for an average to take extra rough trails into account, etc. Not sure how many hit points they'd have. 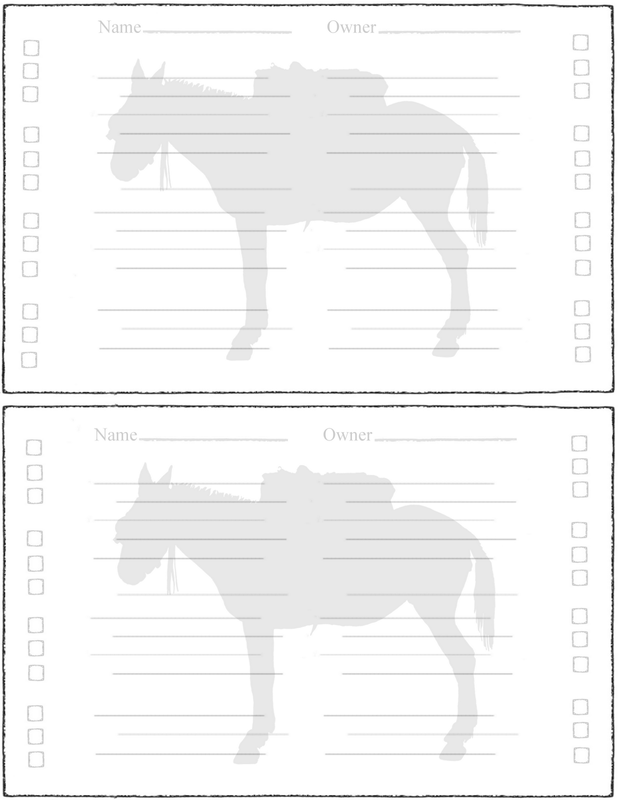 I just left the mule's checkboxes because they are symmetrical. Speaking of, how about a Mastodons? Pack dogs, and sled-dogs (and goblin-carrying wargs?). Also, mules do better on steeper grades vs. horses. You can have pack-horses too (go faster). And ox (and whatever) do carrying and pulling - better for wet marshy lands, and take less feed (no grain needed), but go slower. I think you'd have issues with the Gorillas though, they take many hours of feeding everyday. Chimps, OTOH, might be real good. Like 4x as strong as a man (better leverage f/longer arms). Goats can carry some stuff, and good for meat, milk, and (sometimes) hair, but probably will eat your weapon handles, and whatever else you don't keep away from them. Thinking on horses, you should also leave room for shoes (which horse is shod, did he throw a shoe? ), and traits (likes to bite). Probably applicable for other pack-beasts. On the mythical creatures side, I'd be interested in how much weight flying mounts can carry: Pegasus, Hippogriff, Giant Eagle, etc. I mean, that's gotta be tricky. Also, for those games with subdued dragons, making them into pack-beasts might be interesting. Dinosaurs, meh, maybe. But I think that would be more attention than an adventurer might want, difficult to feed and to house while traveling. Also, when you do the final version of this post, you should include the information about the size / weight each line is worth. Then a person only has to link to one post. I note you didn't back-link (but hopefully people can figure that out (hint: link in October to the right)) to the prior posts with that information. @Anon: Lot's of ideas, thanks. I definitely want to make one for pack horse. The shoes thing would probably be a good event on a random chart unique to each animal type. I think having to track shoe wear might be too fiddly to be fun. 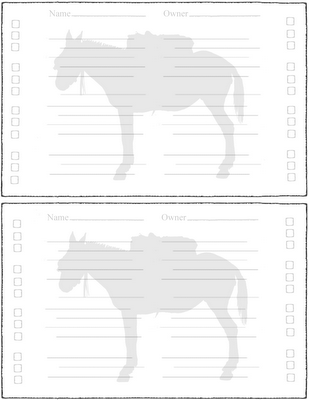 Also, I like traits specific to animals too, see Michael Curtis' 2 page horse pdf for a great example. As far as the range of animals the two hurdles are finding an illustration that works well and knowing the weight capacity. And backlinking, yeah the blog is alive for me, you can see this in the last several posts how my ideas are drafted and develop in the public posts. So I'm usually not even thinking that someone might find this 3 years later, which isn't good. @Darnizhaan: I don't have my PHB with me, how many pounds would that work out too? I'm thinking they might be closer to hill giant strength or something, though not sure. There's a MC who's in a band. Also a barn manager (maybe that's him? ), but no website that I find easily. Also, the dump incoming posts in a hold pattern until approved seems like a reasonable approach. Very nice pdf. The only thing I might change is to try to edit it down to one page, but it's mostly just useful meat as it is-- not a lot to cut. the only song I have in my head right now is "moves like Jagger" - somehow that wasn't the moving I had in mind when I first heard the song, but the pack Jagger is an intriguing thought. Carts? I've seen elephants trailing stuff too but oddly I've never seen an elephant cart. On carts I'm thinking maybe weight isn't increased but the animal can pull it longer. They would require decent tracks to be useable though. Probably next step I need to go back and figure out how far these animals can all move per day in different kinds of terrain, or come up with simple abstract advantages they all have in the terrain they specialize in. Carts don't *need* tracks. You can pull 'em thru mud* and whatnot (but definitely better to have a nice road: larger loads, thinner wheels, fewer axles breaking). But it can't be rough country, and it needs to be the proper grade. Also? Not downhill, unless your cart has brakes (which is making it more into a wagon). 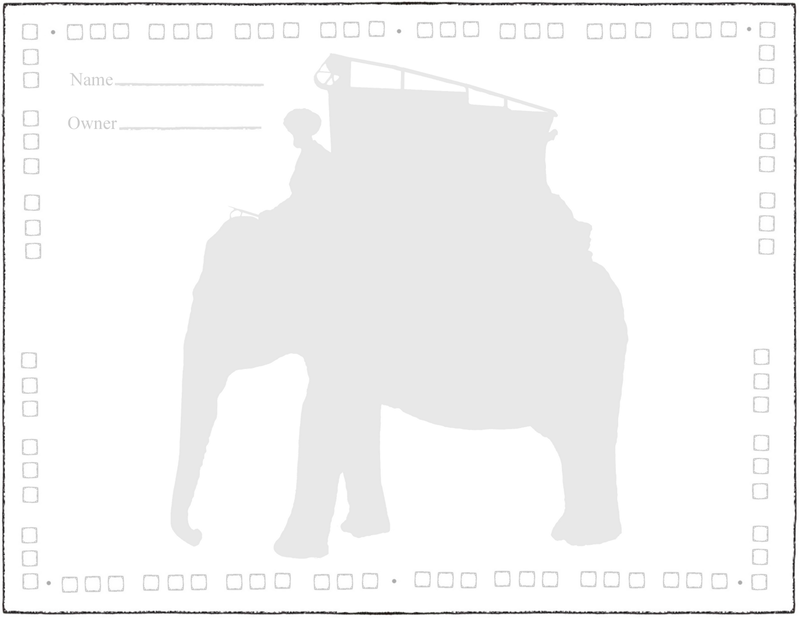 I'd guess with the added gear in either case, this puts the elephant's capacity at around 1000-1200 lb. Also, older military field manuals should have the capacities. Wheeled cart and wagons definitely increase the amount an animal can move, something like x5 if the road is good. You can pull a rolling load much larger than you can carry. Same for a horse or an ox or an elephant. See also J.G. Landels "Engineering in the Ancient World" for his discussion of land transport. Sweet sauce! Great comments. Thanks.